In this Oct. 15, 2017, file photo, Denver Broncos nose tackle Domata Peko reacts during the first half of an NFL football game against the New York Giants in Denver. 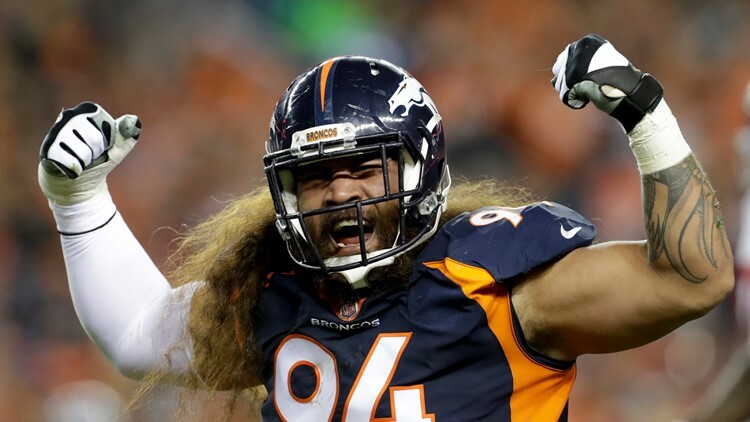 KUSA – Veteran nose tackle Domata Peko has been informed by the Broncos they will not sign him back during the early stages of free agency, sources told 9News. It means Peko most likely will not return as he will become an unrestricted free agent when the negotiating window opens March 11, while the Broncos seek a younger alternative at his position. The team and Peko’s representative never entered contract negotiations. The team did leave open the slight possibility that if they can’t find a defensive lineman in free agency, they could reconsider Peko at a later date. Peko, who turned 34 in November, recently completed his 13th NFL season – all but one as a starter. After playing 11 years with the Cincinnati Peko became a free agent and signed a two-year, $7.5 million contract with the Broncos prior to the 2017 season. He started 30 of a possible 32 games for the Broncos and while Peko was a good value – he brought energy and leadership to the team’s day-to-day environment and did his job in the middle of the team’s defensive front, as evidenced by him playing 52.9 percent and 48.5 percent of the defensive snaps the past two years – NFL teams are always trying to get younger. The Broncos’ defensive line currently consists of Derek Wolfe, Adam Gotsis, Shelby Harris and DeMarcus Walker with Zach Kerr also eligible for unrestricted free agency. "They expressed interest in bringing me back, but no offer or anything like that," Kerr said. Harris is a restricted free agent.